Sad days are upon us, folks: A moving van was reportedly spotted outside the White House on Wednesday. 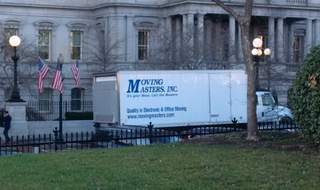 CNN reporter Michelle Kosinski tweeted a photo of a white Moving Masters Inc. truck parked inside the White House gates near the West Wing. The Obamas, who will be out of the White House in two weeks, reportedly offered to leave Sasha and Malia's swing and play set for President-elect Donald Trump's son Baron, 10, to use, but the Trumps passed. Don't worry, though; the play set will have a new home: The first family will donate it to a "local organization serving those in need," People magazine reports. Malia and Sasha were only 10 and 7, respectively, when their family moved into the White House in 2009. The family plans to stay in the Washington, D.C., area and has leased a nine-bedroom, $5.3 million mansion in the Kalorama neighborhood, where they plan to live until 15-year-old Sasha, a sophomore, finishes high school. Malia, 18, will enter Harvard in the fall.